What’s rejuvenating, fresh, and always in style? Green. 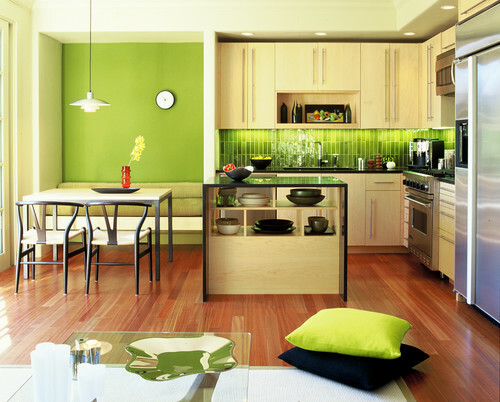 If your home needs a makeover, consider decorating with a shade of green. Incorporating green into your design will leave you with a dream atmosphere. What’s your green color story? Here are a few of our favorites to inspire your design. Greenery was 2017’s Pantone Color of the Year. One of the best parts of design trends is that they don’t have an expiration date. Greenery may have been last year’s color choice, but it’s here to stay. If you want to tell an unforgettable green color story, look no further than this hue. Splash it on all of your walls, or choose a small accent; the results will be incredible. The bright hue brings in undeniable energy. You won’t need much to make a difference. Do you like simplistic designs? What about natural elements? Tell your green color story by bringing nature into your design. 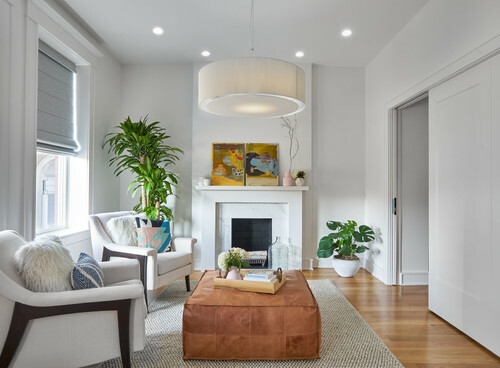 Fresh plants create a gorgeous, refreshing accent piece, like the ones featured in this living room. The large potted plants are eye-catching, and we also can’t help but notice the fresh flowers in this space. We love the gray window treatments, which add dimension and allow for control over privacy and light. So simple, yet everything is strategically placed, pulling this design together. When we think of green, we often think of a bright hue. But, there are so many different shades of green; you can find one that works best for your green color story. 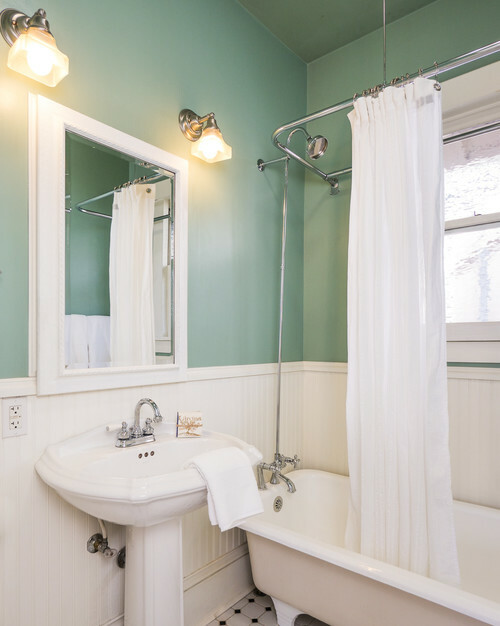 If you want something more subtle, try a seafoam green, like the one in this bathroom. One thing we might add to this design is window treatments. Bathrooms need privacy solutions. Shutters work great in areas with moisture because of their durability. A simple shift of the louvers and these homeowners have complete privacy. Green is often associated with energy, harmony, and safety. Wake up everyday to a refreshing, welcoming green color story. Creating an accent wall is one easy way to bring green into your design. Choose your favorite paint or go for a unique wallpaper. But, be careful with bedroom window treatments. While the sheer curtains work great with this design, the light is eye-level, risking issues with glare and harsh UV rays. Top down shades are a top choice for bedrooms because the light enters across the ceiling, illuminating the space with comfortable daylighting while still protecting your privacy. And, you can’t go wrong with room-darkening or blackout fabrics. 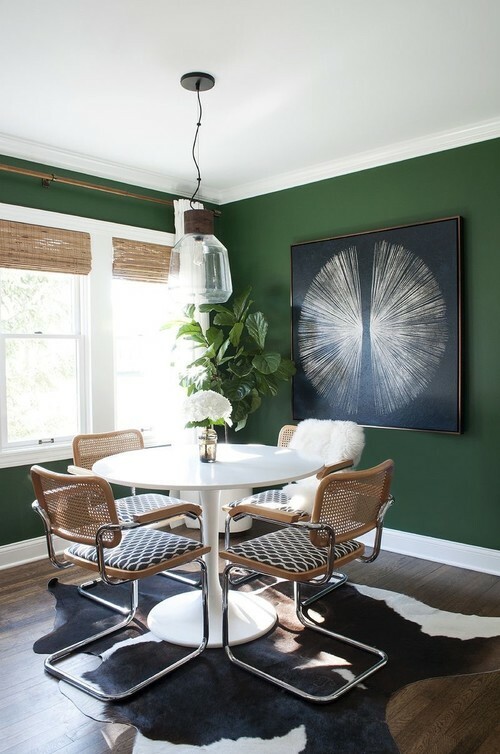 This dining room features captivating dark green walls and gorgeous touches of fresh greenery. The black and white decor accent beautifully, telling a green color story like no other. We especially love the modern chairs, which pair with the natural look of the woven wood shades. And, we can’t forget about that light fixture. The patterns, colors, and decor come together to create a unique design. More and more people are deciding to work from home, which has made it a must to have a home office. Whether it’s an entire room or a quaint area in your home, you need a place that will promote focus and keep your energy levels high. Soft greens are great for offices, making your environment tranquil and inviting. This office space tells a green color story using different patterns and hues. The overall design is calming, but we’d add window treatments for even more control over atmosphere. Shades, blinds, or shutters that offer directional light control are great for offices. You’ll keep the glare off of your screen by guiding the light, and your furniture will stay protected. Do you like the dreamy look of seafoam green? How about the refreshing feel of natural greenery? We want to help you tell a green color story of your own. We’ll show you ways to make your atmosphere comfortable and stylish with custom blinds, shades, and shutters. Let our professional designers bring the showroom to you! Contact us at Grand Valley Window Coverings for a free, in-home consultation.